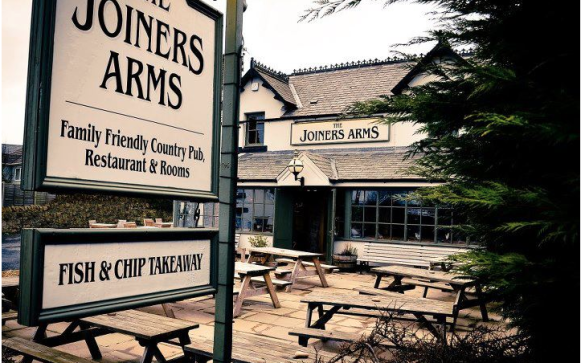 The Joiner’s Arms is a dog-friendly luxury inn located in Newton-by-the-Sea, near Alnwick, most recently famous for its Harry Potter connections (Alnwick Castle served as Hogwarts in the first two Harry Potter films). It is also not far from the mighty Bamburgh beach. Eat: The food is honest, home-style and award-winning, with local produce being almost obsessively focused upon. Unmissable is The Joiners’ “world famous” smoked haddock and leek chowder, but equally worth a stab as a starter is the homemade ham hock terrine with pease pudding and drunken raisins. Mains tend to be excellent versions of pub classics, such as fish cakes or burgers, with a few Asian-inspired options, such as a Thai red chicken curry. Sleep: The inn has five boutique, wow-factor bedrooms, all quite different but all richly decorated in dark, earthy tones. Each has a stand-out feature, such as a four poster bed or low-slung French bed, a roll-top bath or a Juliet balcony with panoramic rural views. One large dog or two small dogs are welcome in either Sandwood Bay or Sebastia. Owners have to provide all doggy paraphernalia and are charged £10 extra per dog per night. Sandwood Bay has a giant antler chandelier and inky blue walls, while our pick is probably the gorgeously spacious Sebastia complete with roll-top bath in the corner of the room. Walk: To burn all this off, walks abound nearby. The Joiner’s Arms is just half a mile from the sea and a string of stunning beaches including Bamburgh and Embleton. It also sits in the heart of Northumberland’s designated Area of Outstanding Natural Beauty which combines spectacular countryside with the breathtaking coastal locations, so your dog will be in heaven.